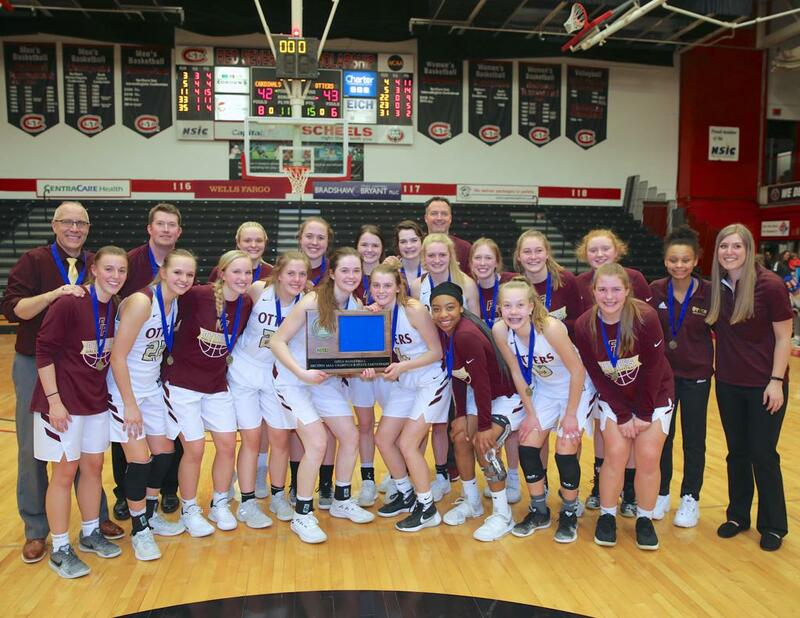 The Fergus Falls girls’ basketball team is headed to the Class 3A State Tournament after handing the Alexandria Cardinals a 43-42 setback in the Section 8AAA championship game on Thursday night at Halenbeck Hall on the campus of St. Cloud State University. Alexandria jumped out to a 6-0 lead and held a seven point lead at 11-4 before the Otters started chipping away at their lead, drawing to within a point at 13-12 and entering halftime down 20-18. The Otters took their first lead of the game when Tori Ratz connected on her first of three 3-pointers, taking a 21-20 lead. They pushed the lead to 23-20, however, Alexandria countered with six straight points to regain the lead at 26-23. Trailing 31-29, Ratz hit her second 3-pointer to once again put the Otters in front, 32-31. Alexandria led 35-32 after baskets by McKenzie Duwenhoegger and Ella Grove, but the Otters pulled even at 35-35 on a three by Sam Evavold. Free throws by Duwenhoegger made it 37-35 Cardinals and a layup by Sabrina Fronning tied the game at 37-all. Ellie Colbeck made a free throw and a layup to give the Otters a 40-37 lead, but the Cardinals tied the game on a basket by Emily Jones and a free throw by Grove. A Tori Ratz 3 with 2:30 remaining made it 43-40, Otters and a basket by Grove with 1:08 remaining proved to be the final points of the night, cutting the Fergus Falls lead to one point at 43-42. At this point the teams exchanged turnovers and the Cardinals started fouling. They picked up their sixth team foul with 23 seconds left and another nine seconds ticked off the clock before they sent the Otters to the line for a one-and-one opportunity. Colbeck missed the shot, Grove grabbed the rebound and the Cardinals used a timeout with 10.8 seconds to play. The Otters had two fouls to give and they executed their defensive game plan to perfection as six valuable seconds ticked off the clock. After a timeout by Alexandria the Cardinals turned the ball over, giving possession to the Otters with 3.3 seconds remaining. The Otters used their final timeout and when play resumed Evavold was fouled on the inbounds play. She missed the front end of the bonus and Jones rebounded the ball but her desperation heave from mid-court was deflected by Colbeck and the ball fell harmlessly to the floor as the final buzzer sounded. Ellie Colbeck scored a team high 14 points and dished out 3 assists. Sabrina Fronning scored 11 points of 5-of-7 shooting and came up with a pair of steals and 3 rebounds. Tori Ratz buried three second half three-pointers to finish with 9 points, while assisting on two baskets and Lily Pearson had 10 rebounds, 3 assists and 2 blocked shots. As a team the Otters shot 53.1% (17-32) and made 55.6% (5-9) of their 3’s. Grove led Alexandria with 15 points of 7-of-8 shooting, and Jones had 11 points, 5 rebounds, and 3 steals. Kaye Paschka dished out a team high 4 assists and Mia McGrane had 3 assists. The Cardinals shot 52.9% (18-34), but made only 1-of-6 (16.7%) from beyond the arc. Fergus Falls won the battle of the boards, 20-17. The Otters had 13 turnovers and the Cardinals had 11. Fergus Falls improves to 23-4 on the season. They will play in the Class 3A quarterfinals on Wednesday at a time to be determined and against an opponent to be determined by coaches seeding this coming weekend. Alexandria ends their season with a final record of 22-5. This was the fifth time in the last nine years that the Otters and Cardinals have met in the Section 8AAA championship game with the Otter win three of the five meeting. Alexandria won the section title a year ago when they beat the Otters 46-45.